Host Johanna Gomez is getting on all the rides ahead of Saturday's opening with the help of Brandon Lopez, our Man in the Mix. Fans of "Toy Story" will be able to transform into a toy as they walk into Andy’s backyard. You’ll even notice that Andy’s footprints are seen on the floor, truly immersing you in the toy experience. 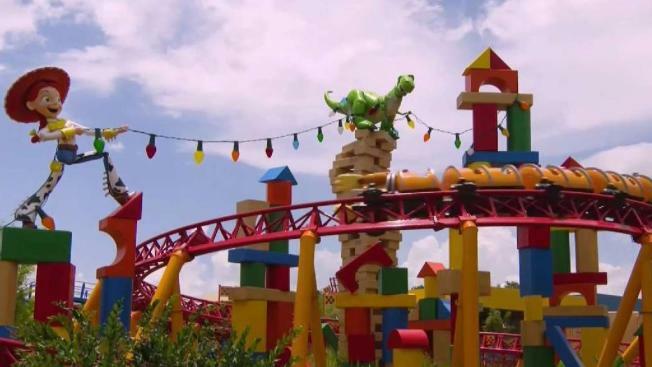 Toy Story Land at Walt Disney World's Hollywood Studios officially opens to the public on Saturday, June 30, 2018. Guests will be greeted with a larger-than-life Woody doll. As guests continue to make their way through Toy Story Land, they’ll notice that ‘Toy Story Mania!’ has a new, more colorful entrance. Another new addition is ‘Slinky Dog Dash,’ a fun, family-friendly thrill ride. If you’re looking to go to infinity and beyond, jump on the ‘Alien Swirling Saucers,’ where guests will spin in a rocket ship. You’ll likely work up an appetite after walking through the theme park. Woody’s Lunch Box offers quick grab-and-go food options and old-fashioned soda floats. Guests can order a grilled three-cheese sandwich, or a BBQ brisket sandwich, among other food options. No trip to Disney is complete without a trip to the gift shop. There are two new merchandise locations offering "Toy Story" themed goods. There is also plenty of character encounters for guests to interact with Woody, Jessie, Buzz and their pals. The Green Army Drum Corps will perform throughout the day. Disney also launched the 'Play Disney Parks' app, which allows guests to play games, answer trivia and much more throughout the parks. At Toy Story Land, guests can download the app, and play 'Andy's Board Game Blast,' while they wait in line. The app unlocks new experiences throughout all the Disney parks around the world. Disney says that Toy Story Land is part of a “multi-year reimagining” of Hollywood Studios. In 2019, they will premiere the 14-acre Star Wars: Galaxy’s Edge themed-land. Also coming in 2019 is Mickey & Minnie’s Runaway Railway, the first Mickey-themed ride-through attraction.